Another week in the books! 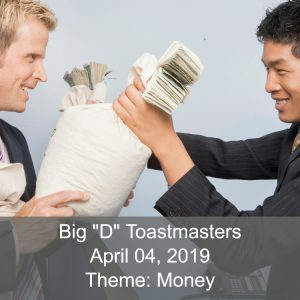 Here is your Big "D" Toastmasters meeting summary for April 04, 2019. This did not happen during our meeting! A huge congratulations to our first time Toastmaster, Janice, who ran an excellent meeting with the theme about Money. Janice was able to end the meeting on time, despite a longer than normal business meeting. Way to go, Janice! Many facts about money were shared with us. We also learned that a lot of members of Big "D", if they won the mega lottery, would take a vacation and never return. It was interesting to hear members answer questions to these questions in their introductions. There were quite a few guests who joined us this week, and they were treated to some amazing speeches. You should have been there! After our usual business meeting, we moved on to Table Topics. Table Topics this week was run by long time member, Steve. Given his background, and the theme of the evening, questions were of a very interesting nature. The most interesting, in the reviewers opinion, was an answer to one question, which basically pointed out that money isn't real. We had four great speakers this evening. Of course, we have great speakers every evening, so this is not out of the ordinary. We were treated to a mix of speeches by very experienced speakers. The first speaker this evening was Steve. We have more than one Steve, so this was not the same Steve who ran Table Topics. Steve's speech was a very compelling speech about the complications of relationships that we have with our parents. Without going into detail, your reviewer can say that a lot of people would have related to this speech in some manner. Our second speaker, Gaurav, told us of his 24 hours in El Paso, Texas. The reasons for his trip will be left out of the review, but while he was there, he did go and see various things in the area. Whatever side of the issue you may fall upon, it was a gripping telling of what he saw while he was there. It gave everyone some real world perspective from someone we all know. We then had a great speech from Catherine, who gave us information on types of leaders that exist. While it wasn't part of the speech, your review writer imagines that many members were secretly trying to determine what type of leader they are. Many members may have felt some of the same feelings as Catherine, in that we don't see ourselves as leaders. However, as our speaker learned, we are all leaders! Finally, we heard from Phoung, who regaled us with stories about the unexpected mentor in her life. Due to the nature of the speech, we have decided not to share the contents in the review. A warm welcome to our newest member, Alex. We look forward to hearing his Ice Breaker, which should be coming up soon. Big "D" Toastmasters in Dallas, Texas, is always welcoming of guests to visit our club and see what Toastmasters is all about. We may be the club for you, we may not. You won't know until you visit us. To learn more about Big "D" Toastmasters click here. For meeting time and location, click here. Want to join? Learn more here. Another week in the books! 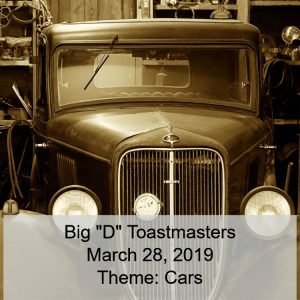 Here is your Big "D" Toastmasters meeting summary for March 28, 2019. A huge congratulations to our first time Toastmaster, John, who ran an excellent meeting with the theme about Cars. We learned many things about cars, including the great story of how Ford almost bought another car company, way back in the day, but the CEO of the other company changed his mind at the last moment. This lead Ford to build a racing car that ended up beating the other companies offering. We had four great speakers this evening. Of course, we have great speakers every evening, so this is not out of the ordinary. We were treated to a mix of speeches by long time members, and one who is leaving. Our first speaker, Bach, gave a speech out Perfectionism. We learned various things about the topic, however, since your review writer lost his notes, not much can be recalled to write here. Of course, if you were there, you know how great it was. The second speaker, Carl, gave his speech called, "Ciao." This was Carl's last speech with us, as he is moving on to another group. Andy gave a speech about Learning from the Greats. Since Andy does other public speaking outside of Toastmasters, he's had the chance to meet with some well regarded public speakers who can teach all of a thing to two about public speaking. Our final speaker was Micky, who gave a great speech about the times she was robbed while working at a convenience store when she was younger. As with all of her speeches, it was well done, with just the right amount of sarcasm from Micky we've come to expect. While we had no new members this week, we've had a few members join in the recent weeks. A warm welcome to those new members! Another week in the books! Your friendly content provider has missed a few meetings due to other obligations, thus no review of those meetings. 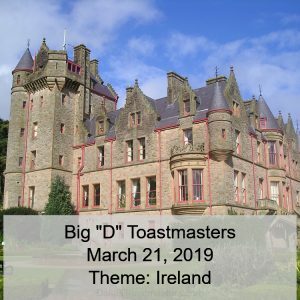 Here is your Big "D" Toastmasters meeting summary for March 21, 2019. This week the Toastmaster was Elizabeth, who covered the role for another member. She decided that the theme this week was going to be Ireland, in celebration of the recently passed St. Patrick's Day. One of the best parts of the Ireland theme was the many little limericks that Elizabeth provided us with. Since I wasn't expecting to mention them in the summary I didn't write them down as they were told, and thus, they don't make this weeks review. We learned many other facts about Ireland, thanks to Elizabeth, and our friends at Google and Wikipedia. After our usual business meeting, we moved on to Table Topics. Table Topics this week was run by first timer, Katie. She did an amazing job in the role. Questions were based on luck, holidays and more. For example, one person was asked the question, "You've led an amazing life and will have a holiday named after you. How would you want your holiday to be celebrated?" The response was great, and of course, you should have been there for the answer. We had four great speakers this evening. Of course, we have great speakers every evening, so this is not out of the ordinary. We were treated to speeches by many long time members this week. Josh's speech was about Voices. While your content provider had to step out for this speech, it's fair to say that it was well received, as Josh won the Best Speech of the Evening award. Our next speaker, David gave us reasons we should join a club. Not a Toastmasters club (like Big "D" Toastmasters!) but any club that could help you in life and/or professional career. Boating, technology, wine clubs, etc. They were very good reasons, and lots of examples of how they could help you. After that, Stephen gave a great speech on the "Gentle Art." In case you are wondering, that's the gentle art of Ju-Jitsu. Many facts were shared about this Japanese marshal art, including how it has tie in's to one of the major fighting circuits that are currently popular in the US. Finally, speaking of clubs, Steve (not Stephen!) gave us a speech that he will be presenting to a Wine club in the near future. He was working with Visual Aids and wanted to get feedback from the club about how his speech went. It was a great speech, but sadly, there were no samples available. The 2019 Toastmasters Contest season has begun. Big "D" Toastmasters is pleased to announce the Spring Contest winners for our club. The first contest was the Evaluation Contest. Here the contestants listen to a 5-7 speech from a Toastmaster they've never heard from before, and then give their evaluation of the speech. Andy, who is always a strong evaluator, won the Evaluation contest at Big "D" Toastmasters. The second contest is the International speech contest. This speech has some minimum requirements, including that you must have completed a specific number of speeches prior to competition. The winner of the International speech contest at the club level is long time member Michelle. Andy and Michelle will go on to compete in the area contest on February 24, 2019 in Dallas, Texas. Congratulations to the club winners, and we wish you great success at the area contest! Another week in the books! 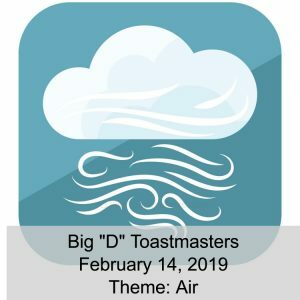 Here is your Big "D" Toastmasters meeting summary for February 14, 2019. This week's theme was "Air." Now, you might be wondering if this had anything to with "Love" in the Air. The answer to that question, is No. To quote our Toastmaster this week, Rob, "What does a 20 something single guy who is scared of commitment do on Valentines Day? Volunteer to be Toastmasters!" After our usual business meeting, we moved on to Table Topics. Table Topics this weeks was run by a member that hasn't shown up in a while, Aleluya! He stepped right into the role without missing a beat, and asked many questions about Valentines day. "What was your most memorable date?" was just one of the very interesting questions asked. We had 4 speakers this week. The speech summary this week could be that if you enjoy things you should do them early in life. Like running an ultra marathon, though if you do make sure you have your Passport when going between countries, or you might end up homeless. Okay. perhaps I should explain in a little more detail. Brian gave us the story of his running an ultra marathon. By 'ultra' we mean over 24 hours of running. Great speech and a great visual of tree roots reaching up and grabbing runners in the middle of the night. Naomi had us asking ourselves if we are doing it right. Think of it this way, why should you work 40 years just to spend time with family after you retire? Wouldn't it be better to do those things now? Katie entertained us with a story of her travels overseas during her college days. We learned the importance of always having a passport with you when traveling. Oh, and never stash a friend in the trunk when crossing the border of a country. What happened? Let's just say you had to be there to get the full effect of what happened next. Our final speaker was Ray, who gave us some very interesting information about the homeless population and services in the Dallas area. It's a math problem, he says, but one without an answer. If you know someone who is homeless, and want to find resources to help them, please visit OurCalling. We had no new members this week. However, several of our visitors are looking to join, and could do so next week. Come join us and you could be the next new member! Another week in the books! Here is your Big "D" Toastmasters meeting summary for February 07, 2019. This weeks theme was "Get Uncomfortable, Fight The Fear." We were entertained by first time Toastmaster, Ray. He did a great job as Toastmaster even if he did have a typo on the agenda of "Toastermasters." We also had quite a few guests who joined us this week, and they were treated to some amazing speeches. You should have been there! Table Topics this weeks was run by Janice. In keeping with the theme of the evening, many questions were asked about fear, and how you overcame said fear. The questions varied quite a bit, and all questions were quite entertaining! We had three speakers this week, with one of them being an Ice Breaker. One of our new members, Spencer, gave his Ice Breaker titled, "Spanish 101" which told us his story of how he started to fear public speaking, and the many things he's done to overcome those fears. Our second speaker was David, who talked about attire in the work place. Sometimes it's necessary to wear a suit in your job, and other times it wasn't. There was a great story in this speech about his first day at his job, and people wondered why he was wearing a suit. The final speaker was Shawna, who gave a great speech about "What's on the Other Side." It focused some on the topic of a guest speaker she saw the previous weekend, and went on to explain to the club how we have to look to what is on the other side. A great speech to end the night on.